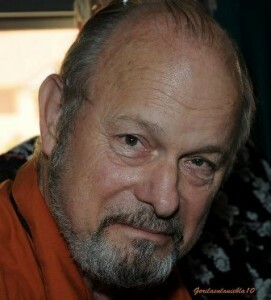 Joe Haldeman is the youngest writer to be named a Grand Master by the Science Fiction and Fantasy Writers of America, and has earned steady awards over his forty-three-year career: his novels The Forever War and Forever Peace both made clean sweeps of the Hugo and Nebula Awards, and he has won four more Hugos and Nebulas for other novels and shorter works. Three times he’s won the Rhysling Award for best science fiction poem of the year. In 2012 he was inducted into the Science Fiction Hall of Fame. The final novel in a trilogy, Earthbound, is out (after Marsbound in 2008 and Starbound in 2009). Ridley Scott has bought the movie rights to The Forever War. Joe’s next novel is Work Done For Hire, appearing soon. When he’s not writing or teaching—a professor at M.I.T., he has taught every fall semester since 1983—he paints and bicycles and spends as much time as he can out under the stars as an amateur astronomer. He’s been married for forty-seven years to Mary Gay Potter Haldeman.